Pro brushes in TwistedBrush Pro Studio generally have additional control parameters that add great flexibility to each brush. The Brush Control panel will automatically display anytime a brush is selected that has additional control parameters. Some brush may have a button for selecting patterns, shapes or textures. 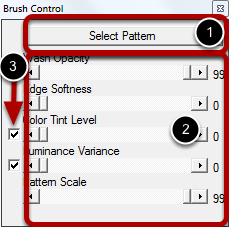 Commonly one or more control sliders are presented in easy to understand terms related to the brush that is selected. Some control parameters may appear with a checkbox next to them. When checked that option is enabled. Otherwise it is disabled.